The Downtown Senatobia Historic District was listed on the National Register of Historic Places in 1994. The Downtown Senatobia Historic District is composed of most of the traditional central business district area in the city of Senatobia, Tate County, Mississippi. The sixty-one principal buildings which make up the Downtown Senatobia Historic District are largely located on one of the two major streets in the district — North/South Front Street, fronting on the Illinois Central Gulf Railroad, and West Main Street (MS Highway 4), which connects Interstate 55 to the east of downtown with U.S. Highway 51 on the west. 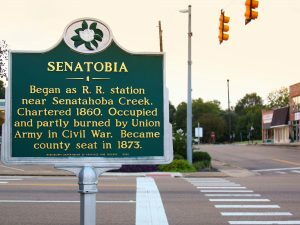 Other historic resources of the Downtown Senatobia Historic District can be found on West Tate Street, South Center Street, South Ward Street, North Ward Street, and North Center Street.